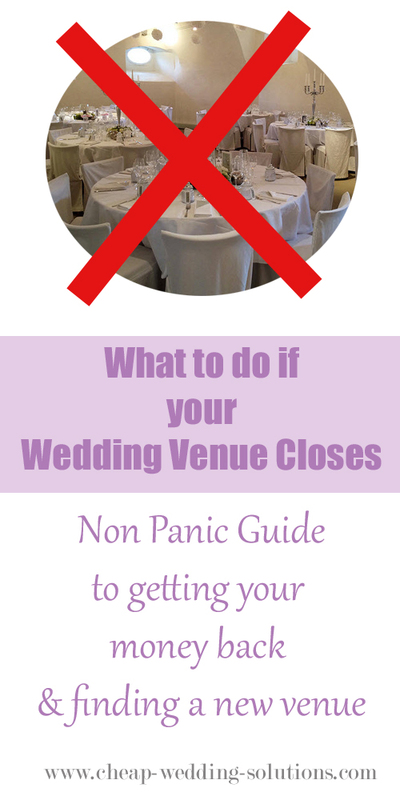 The first thing to do if you find when your wedding venue closes is don't panic. ... follow my checklist to get yourself back on track with your wedding plans. 1. Contact the venue yourself and find out if they have any plans in place for an alternative venue or getting your money back. When you call the venue ask to speak to the manager as they will have a better idea of what is going on. 2. If you have Wedding Insurance then you will be ok, find your documents and give them a call. Weddings can cost as much as a new car and as your reception is costing you probably half of your budget it is a really good idea to take out insurance... because you never know! 3. Hopefully you will have paid the venue in part or full with a credit card as the Fair Trade Credit Billing Act means you can file a dispute if the venue has not provided the services you have paid for. The only downside is there is a 60 day cut off window for claims but if you paid a recent installment by credit card the chances are you will get some of your money back. I know it will feel that it's just you that this has happened to but there will be a number of other couples also in the same boat, so competition may be a bit fierce for an alternative place. See if your venue has a sister hotel that is able to take your booking, as service and menus etc will be of a similar standard as to what you originally wanted. Next have a look at social media and your local newspapers to see if any venues have announced that they have space for couples that have been let down by your venue. Read through local wedding forums and see if any brides have had to cancel their wedding, there may be a possibility that you could take on their booking so they don't lose all of their deposit. Make sure you negotiate with them so you also get a good deal. Plus check with the new venue that they will be happy to do this before you part with any of your money. If you are having no joy, you could contact your local newspaper and tell them your story of your wedding venue. Local newspapers love a hard luck story and in the article say you are looking for an alternative venue if anyone has one on the date you would like. You never know what might be offered! The most important factor is to stay positive, you will be ok, you have each other and your new venue will be just as lovely if not more so than the original.